I’ll be the first to admit when I first started my first business it was a disaster. However, over time I perfected my business growth strategy and I built a multi-million dollar business across India called BNI. The secret to a wildly profitable business is to treat your business as a whole system. Once I made this realization, my business became INSTANTLY profitable. Customer centric companies have 2x higher average revenue vis-a-vis companies that are not according to a recent EY report. Welcome to first in a series of seven business growth pillars that can help your company scale up. So here are 5 ways to be a more customer centric company. Let me share a personal story where I got very present to the need to be a customer centric company. I used to be in the rice business, over a decade back. We took part in an exhibition where we had an opportunity to interact with our end customers, and typically, those were housewives. Over three days we interacted with over 2,000 housewives. And we kept on asking them: “Why do you buy our rice? We got some surprising feedback. 90% of the housewives said that they loved our product because the rice was fat. Yes you read that correctly: FAT! So we started to look into this deeper, and we looked at what did that mean for the rice to be fat? And we were able to identify that one cup of our raw rice was able to produce four cups of cooked rice. We found out that the competitor’s rice was only able to produce two and a half cups of cooked rice. So our brand was delivering tremendous value. This is something that we had never even communicated to our customers. It’s our customers who were happy with the product, telling us this why they were buying our rice. This new insight completely changed the way in which we marketed our product. We found a way to articulate the reason why customers bought our rice in our marketing and sales. We were able to grow our revenues by over 100% because of this new insight. 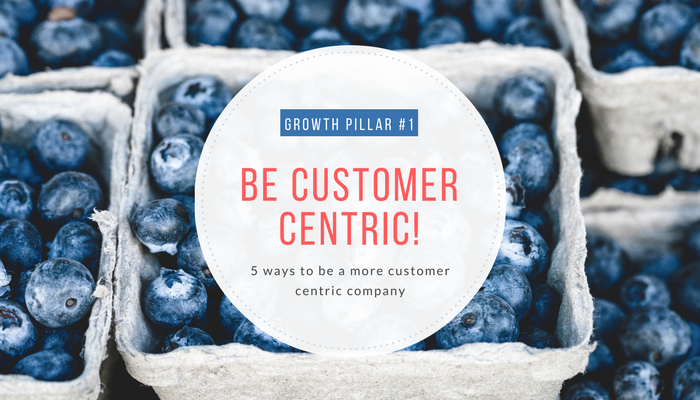 So let’s cover 5 simple ways in which your company can be more customer centric. Proactively take feedback from your customers. And in this day and age, it’s so much easier. Use tools like Survey Monkey for online surveys. Use every customer interaction to solicit feedback. For a customer centric company, feedback is the breakfast of champions. Customer Relationship Management software helps you be more customer centric. Every time you have an interaction with either a prospect or an existing customer, always have it recorded. CRM software helps you manage this easily. I personally use a free cloud based software called Hubspot. This software helps me track the interaction from a lead, qualify a prospect and then turn into a sale. This is a great way to track how many leads you have and the status on each. Want to know how to persuade prospects and sell more? The power of influence is usually all that separates the successful from everyone else. These are some tactics, discovered through psychological research, that you have probably not yet heard about, but have the potential to increase your persuasive abilities. While many of you may be familiar with the concepts of persuasion by master influencer, Dr. Robert Cialdini in his book Influence, I’m going to cover 8 lesser known persuasion secrets to sell more. Want to sell more? Talk with certainty and energy. Don Moore from Carnegie Mellon’s Center for Behavioral Decision Research has published research showing that confidence even trumps past accuracy in earning the trust of others. We prefer advice from a confident source. When people exhibit certainty and energy in their presentations are perceived to be more confident. Use body language which conveys certainty. Use a higher volume and pace in your speech. Both these convey greater certainty and energy. People naturally associate confidence with expertise. Know your product, know the facts about its benefits and believe in what it does – true confidence becomes from knowing and believing what you’re saying. It’s essential that we communicate our confidence to others in order to persuade them. If you want to persuade people to buy into your message, start with something they can agree with. In a research study by Jing Xu and Robert Wyer established, there were lingering effects of messages people agree with. So when you want to sell more, make statements or represent a world view your customers can agree with first – even if they have nothing to do with what you’re selling. I tend to use analogies and build agreement frames first. For example I might ask a series of three or four questions where the prospects answers will reaffirm a world view that they hold. After that I will introduce my product or service to them. Repetition of words or a visual pattern not only causes it to be remembered (which is persuasive in itself), it also leads people to accept what is being repeated as being true. Make sure you repeat key benefits or unique serving proposition in your sales copy, ad campaigns and presentations many times. Use friendly repetition to create familiarity and hence liking. Growing your business requires you to develop products and services that clients want to buy. It is no use if you don’t have a market for your product or service. I share 2 powerful strategies to help you develop products or services that are designed to sell and grow your profits. 1. Know your existing clients – It is important to develop a close understanding of who buys from you and why they buy from you. I talked about this in detail in my blog why do customers buy from you really? Develop a profile of your ideal client. Understand them in terms of psychographics and demographics. What are their pain points, aspirations, age, and gender? What sort of things would they say to others when they recommend your products or services? Make sure that your products are tweaked to more effectively meet the clients needs. Be in regular touch with your clients to understand how things are changing in their business or life. This will give you clues and anticipate what sort of products to develop next. Regularly review your Ideal Client Avatar to make sure that it reflects your current client base. 2. 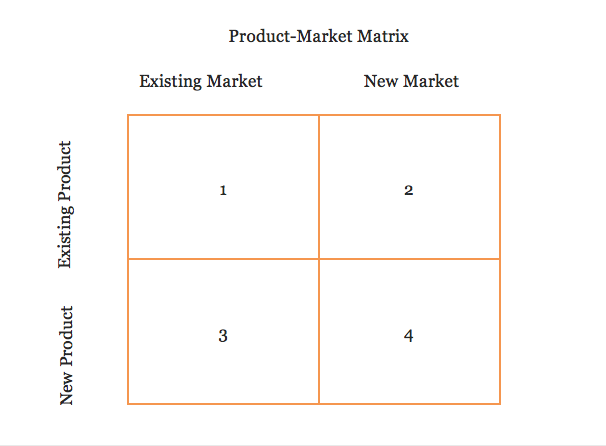 Use the product-market matrix – Once you have understood your clients well then use this product-market matrix to assess which markets or products to develop next to grow your business. Who is your ideal client? Who is the market for your product or service. You can profile your target market in terms of both socio-economic data (such as age, income, gender etc.) and psychographic qualities (such as personality, values, lifestyle and attitudes). Clarity about the kind of client you would like to serve allows you to say “NO” to others and help you streamline your services to dominate a niche. What is the specific message you want to communicate to this target market. What is your Unique Serving Proposition (USP)? How do you and your company serve your target audience? How do you specifically add value for this target market.You have to find a way to communicate exactly how you are unique in serving your clients i.e. what customer problem do you understand deeply or what solution do you provide.